Unless you’re Justin Bieber, it’s hard to get away with wearing a Kelly Kapowski t-shirt in public. Everyone loves her and feels really, really bad that her dad couldn’t afford to send her to prom, but for some reason it’s not okay to talk about it. The good news? Thanks to a little something known as the interweb, us 90s-lovers can indulge in our deepest 20th century desires without having to carry around a photo of LeVar Burton in our wallets. LeVar Burton is a Twitter dragon. Seriously, he has 1,714,074 followers and more tweets than Mr. Spock. It’s a little disturbing to hear squeaky-clean LeVar say things like “Wind is blowin’ like a mutha tonight in LA,” but at least he knows how to properly use an apostrophe. That alone makes me feel warm and fuzzy and all Reading-Rainbow like. Education rules. If that’s not enough for you, LeVar’s working on an RRKidz iPad app. 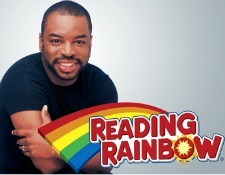 No word on the exact release date, but soon you’ll able to take LeVar Burton and his excellent stories with you to grocery stores, movie theatres and public washrooms. Zach Morris isn’t all that interesting on Twitter because he tweets as some guy called “Mark-Paul Gosselaar,” so check him out on Jimmy Fallon instead. Everyone on Jimmy Fallon is cool by association, and Preppy’s outfit will make you swoon like that time your parents gave you a Zach Morris doll and Mr. Big poster ALL IN THE SAME DAY. Jessie Spano is on the Twitter, but if you really want to feel like you’re an angry 13-year-old watching SBTB in your parents’ basement, buy her book, Ask-Elizabeth. It’s about teen angst and problems and stuff and should bring back all sorts of memories about making music videos and being so excited…so excited…so scared. The book is endorsed by all sorts of relevant people like Eva Mendes, Cameron Diaz and Jennifer Garner, so it must be good. If the celeb factor isn’t reason enough, just say it got 5 stars on Amazon. And it’s all over Oprah.com. This creepy PSA from 1992 has shaped many a childhood. And by shaped, I mean scarred. But still, although those blue creatures look like rejects from the fuzzy underworld, everyone secretly loves this song. So the next time your coworkers are on a multi-day Boots with the Furrrrr bender, start singing this little gem. Before you know it, Flo Rida will be out of your life forever and your office will be transformed into a nostalgic PSA ad. And when you get sick of this one, start singing “Drugs Drugs Drugs.” You’ll be employee of the month in no time. That, or you can move to a small town where the community cable station still plays both ads on a daily basis. This place actually exists, by the way. I’ve been there and it’s amazing.